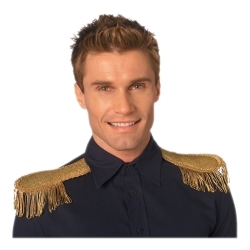 Includes one pair (2 epaulets) with tassel fringe trim. These shoulder epaulets are made of Lamé fabric with matching fringe and can be used to dress up almost any military or royal uniform. They are popular with our directors for use in shows such as “Into the Woods”, “The Sound of Music”, “Shenandoah”, and “Cinderella”. The epaulets are colored as pictures, measure 6.5” long by 3” wide and will need to be affixed to the costume by stitching or another form of fabric adhesive.